As you start out your journey as an entrepreneur, you'll make decisions that might be good or bad for your business. While it's normal to make mistakes, you'd want to minimize risks by learning from successful business owners. In this episode, discover tips on how you can make your business more profitable and rewarding. 06:43 – What should you offer? Achieve the kind of business you want. Get mentored by a world-class expert. The purpose of a business is to attract and maintain a customer. [Click To Tweet]. Aim to meet an ongoing need. [Click To Tweet]. Complement rather than compete. [Click To Tweet]. Be the glove to someone else’s hand. [Click To Tweet]. James Schramko here, welcome back to SuperFastBusiness.com. I do appreciate your reviews on iTunes. If you do get a chance, I would love you to make a comment. Today, I’m talking about 14 pointers for new business owners because if you’re just starting out on your entrepreneuring journey, the tips can be a useful guide towards making your business profitable, long-lasting and rewarding. And isn’t that the kind of business you want? The first thing to get right is to make it about the customer. Think about helping people solve their problems in the best possible way. And you actually want to help the most people that you can. If you can do that and do it consistently, the money will follow. I think too many people are thinking about themselves. They start a business because they need money or they have a great idea. Wonderful. However, you really need to make sure that you keep it about the customer. Without a customer, you don’t have a business. The purpose of a business according to Peter Drucker is to attract and then maintain a customer. Next up I’d say, ditch the one-time approach. Repeat business is the key to wealth. I’ve done a number of episodes on the recurring subscription income. I’ve interviewed John Warrillow from “The Automatic Customer” and I’m convinced from my own business experience that repeat business is really where it’s happening. So farm more than you hunt. Set up your business to look after people who already buy from you if you possibly can. Aim to meet an ongoing need, not just a one-time need. Example of a one-time need might be a wedding dress shop. An ongoing need might be software that helps people send emails. Make your customers so happy with your products or services that they will gladly buy from you again and again. That’s how I’ve set up SuperFastBusiness membership. It’s an online business coaching community where I help people by logging in every day and answering questions. People will stick around because they continue to get help. Let customers sell to themselves. Explore the problem at hand. Ask investigative questions for your sales copy, or your videos, or your audios, and through a guided approach, let customers recognize the value of your solutions as if on their own. If someone decides to buy your product without you having to ram it down their throat, then your marketing is good, it set up the right environment, and because the customers are selling themselves on the idea, then they will support it better. You’ll have low refunds, your sales will run seamlessly. Next is look for people who have the right customers or bigger fish. Sell to resellers with multiple customers or companies to which you can offer bulk deals, where you can get access to more than one customer at once. I used do this when I was at Mercedes Benz. I used to sell cars to leasing companies who would buy 50 at once, or to large corporates who would buy a dozen cars for their employees in one hit. Sometimes chasing a slightly bigger deal is going to get you a much more leveraged payoff for the same effort. Once you’ve got your first multiple recurring income stream up and running, I suggest you add a second one. The danger of having a job for example, the traditional safe job, is that you’re getting all of your money from one income source, and as a business owner, now you have the opportunity to look at getting many customers so that you’ll never be stuck if one customer doesn’t like you. I mean if your boss doesn’t like you and you have a job, that’s bad luck isn’t it? But if you have hundreds or thousands of customers paying you on returning income through one or two different income streams; in my case, I have my coaching business but I also have my services business. It means my business is well-protected. Have a routine. A common misconception for new entrepreneurs is that freedom means not having to have a schedule. It means you can just sleep in, do whatever you want, whenever you want, with whomever you want, la di da. The problem is that it can actually be frightening, that level of freedom because you don’t really know what you’re supposed to be focused on and you can get out of kilter or out of rhythm. But by blocking off specific times of your day or week for doing the work, you basically claim the rest of your time by default for you and you gain more freedom by having a routine. And I found since having time blocks to do my work that means that I have more freedom because I’m not always on. Complement rather than compete. See if you can come up with products or services that people are very likely to purchase if they already have another product or a main product. When I first started out, I was an affiliate for website software and before too long, I created a cheat sheet guide that helped people who had that particular software to get better results from the software. At some point, that software was a great income stream but my cheat sheet actually sold more because there were more people who owned the software than people who were going to buy the software. That was really my main discovery. So see how you can complement the market rather than just be another competitor. See if you can be the glove to someone else’s hand. Stay up-to-date. Make sure your product or service remains relevant and useful by doing research and realizing improvements are required and implementing on them. You’ve got to stay in the game especially online. The software that I started promoting doesn’t even exist now. It pretty much went to the rafters when the technology outstripped it, the founder got sick, and it’s no longer there. So imagine if my old business was founded around this one software product still. It would be a tremendously bad strategic error. You’ve got to iterate, innovate and keep moving forward. One way to stay fresh is to join SuperFast membership. SuperFastBusiness membership is where you can get access to me and a whole bunch of other smart people who are staying right on topic and finger on the pulse. We know what’s happening online before most people. Offer only the best possible solution. Resist the temptation to continue promoting a product after something better comes along. You can win a lot of loyalty by directing people to the better alternative even if it means losing sales. If you go to a department store and they’re sold out of a product, there’s a good chance they’ll redirect you to a nearby store that might be the competitor that has what you’re looking for. In doing that, they will retain your loyalty for the next purchase. If they don’t tell you about it, or even worse, if they sell you something that’s just not the right solution and you find out that there was one just around the corner, you are going to be upset. Evolve with the marketplace. Keep your finger on the pulse. Stay up with the trends and modify your offerings. But do it subtly. It’s going to take a series of small changes. It’s like Google’s algorithm. They change the algorithm every day. But there are just some major updates that they release, but they’re changing it all the time, they just don’t tell you. They’re testing the color of the ocean on Google maps for example. They don’t have to announce all the changes, just do some things behind the scenes. Promote what works for you. If you use something yourself, whether it’s your own product or something you sell as an affiliate, you’ve got a lot more confidence in its usefulness because you have been a good test case for that. You did the work, you did the research, you know why it’s a good product or service so you can believe in it. You can create supporting documents, you can put material that you used for your own research to help others make a decision. Beware of workaholism. Given it takes some effort to get a business going, it’s not going to do you any good if you burn out chasing your dream. If you have at least a whole day away off the computer, two if possible, that will be a good start to rejuvenate and rest. Find out what activities get the biggest results and use that to achieve more in less hours a day. You will see some people proudly declare they work 15 or 16 hours a day. And you can tell from their blackened-out eyes and their fat tummies that they’re not healthy and they will have health issues. And if you’ve ever visited a hospital or a doctor, then you know that’s not the place you want to be. It’s not worth it pursuing everything if you’re going to blow out your heart, if you’re going to have high blood pressure, if you’re going to skip on your nutrition, if you’re not going to exercise, it’s not worth it. You could have all the money in the world but if you don’t have your health, you’ve got nothing. And too many people have paraded around with this beating of their hands on their chest about how much they work and how incredibly amazing they are, and I just feel sorry for them. I think it’s very sad. There’s a lot of champions of getting a good night’s sleep. It’s the new black. I suggest that you get a good night’s sleep, that you block your day into no more than 4 hours of solid work because really, the rest of the time you’re just spinning your wheels. And take days off during the week. That’s important. Take time to think. Just because you’re not at your computer and not working, doesn’t mean your brain switches off. So think about what are the right things you should be doing for your business? Question your assumptions. Mull over a little challenge over a series of non-work things. Maybe when you’re playing golf or having a surf, just let things mull over a bit. Your brain is amazingly powerful at solving problems when you’re not focused on them. From the business model you’ve chosen to the prices you charge, all of these things are the sort of things that come up as ideas when you wake up from sleep, when you’re having a shower, when you’re cooking a meal, that’s good thinking time. So don’t discount that. That’s why I say 4 hours at the computer maximum per day will allow you a lot of other time to think and actually get more done. Target sustainability. Aim not just for a business model that lasts but for a lifestyle that can fulfill you for years to come. If you can do on a daily basis what you’d be happy to do for the next 10 years, that’s when I think you’re successful. Picture now what it looks like. Set your sights on what’s really important to you and it might be family, relationships, giving back to community, spirituality, health, might not just be money. It’s not money, money, money, money. It’s a lot of other things. And then go and get it. Get things right, get things the way they are. I’m lucky now that I enjoy a routine and a lifestyle that I know I can sustain and it’s putting a bit of thought into what I want. Be careful what you wish for because you might just get it. I’m James Schramko. I hope you’ve enjoyed this podcast. 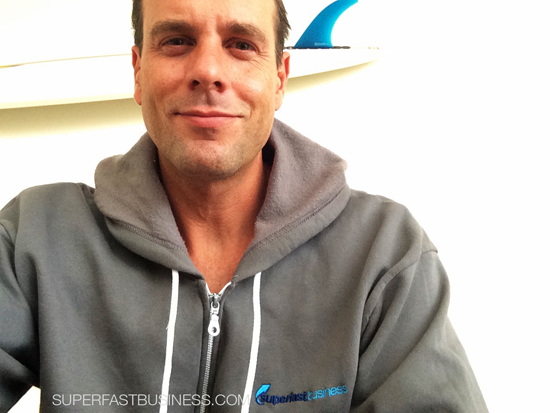 I look forward to seeing you inside SuperFastBusiness membership. When you get a chance to login next, I’m looking forward to helping you grow your business more profitably and I appreciate any ratings you could put on iTunes. Thanks so much for listening. Leave a comment: Which of these pointers have you applied in your business?